The Vance Center held its third annual Celebration of International Pro Bono Excellence attended by more than 65 participants at the New York City Bar Association. The event recognized the pro bono achievements of six law firms and gave special recognition to Vance Center Committee member Marcia Tavares Maack of Mayer Brown for her leadership in the “Keep Families Together” initiative. Vance Center Chair Ted Maynard kicked off the celebration, and New York City Bar Association President Roger Maldonado described his experiences with the Vance Center since taking office in May 2018, including attending its conference on women’s incarceration in Bogota, Colombia. Shearman & Sterling advised International Rivers on the legal framework governing river protection and its application to river conservation efforts in Myanmar. 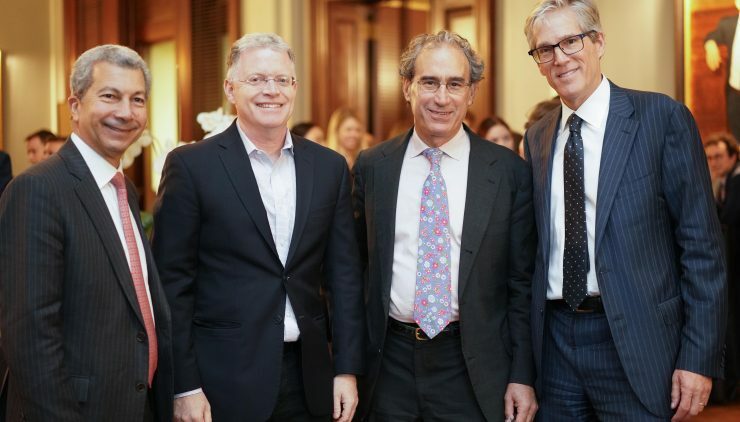 Louis O’Neill of White & Case and Brian Burke of Shearman & Sterling accepted the awards and expressed appreciation for the impact that the projects had on their pro bono clients and the lawyers working on them. Orrick, Herrington & Sutcliffe advised the Centre for Humanitarian Dialogue of the Central African Republic on that country’s obligations under international law regarding its Nationality Code, including a comparative analysis of the nationality laws of Brazil, Colombia, Kenya, and South Africa. Sullivan & Cromwell on behalf of indigenous Miskito women in Nicaragua produced a brochure, in the form of a comic strip, to educate women and girls about legal protections against sexual violence under national, customary, and international law. Lorraine McGowen of Orrick and Werner Ahlers of Sullivan & Cromwell, both Vance Center Committee members, as well as Ahler’s colleague Renata Mascarenhas accepted the recognitions. Debevoise & Plimpton drafted two Article 15 submissions to the International Criminal Court seeking preliminary investigations of international crimes of a confidential nature for confidential clients. ACOS Alliance’s board co-chair and New Yorker editor David Rohde thanked Covington & Burling for its help and described the risks that journalists run in conflict zones. Mary Burner, the firm’s pro bono manager accepted the recognition, as did Elizabeth Nielsen and partner Natalie Reid on behalf of Debevoise. The program concluded with special recognition of Vance Center Committee member Marcia Maack of Mayer Brown for her leadership in the Vance Center’s “Keep Families Together” initiative, as well as many years of wide ranging engagement in pro bono representation and related initiatives. Please see the full program of the Vance Center’s Celebration here.